"Talking to Humans is the perfect complement to the existing body of work on customer development. If you are teaching entrepreneurship or running a startup accelerator, you need to make it required reading for your students and teams. I have. " "If entrepreneurship 101 is talking to customers, this is the syllabus. Talking to Humans is a thoughtful guide to the customer informed product development that lies at the foundation of successful start-ups." "The book is really great! It perfectly fills the gap for a practical, step-by-step guide to conducting customer discovery. I'm updating my syllabus now to incorporate Talking to Humans into my class immediately as required reading." "Giff has been one of the thought leaders in the lean startup movement from the very beginning. Entrepreneurs in all industries will find Talking to Humans practical, insightful, and incredibly useful." "Getting started on your Customer Discovery journey is the most important step to becoming a successful entrepreneur and reading Talking To Humans is the smartest first step to finding and solving real problems for paying customers." "A lot of entrepreneurs pay lip service to talking to customers but you have to know how. Talking to Humans offers concrete examples on how to how to recruit candidates, how to conduct interviews, and how to prioritize learning from customers more through listening versus talking." "A must read for anyone who is considering creating a startup, developing a new product or starting a new division. 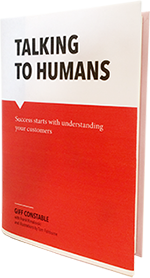 Read this book first – a great guide to the evolving art of customer discovery. Don’t waste your time building products that your customer may or may not want." "This is a great how-to guide for entrepreneurs that provides practical guidance and examples on one of the most important and often under practiced requirements of building a great startup—getting out of the office, talking directly with customers and partners, and beginning the critical process of building a community." "Current and future customers are the best source of feedback and insight for your new product ideas. Talking to them is intimidating and seemingly time-consuming. In this focused, practical, down-to-earth book Giff Constable demystifies the art (not science) of customer discovery helping entrepreneurs and product veterans alike learn how to build a continuous conversation with their market and ensure the best chances of success for their ideas. Want to know what your audience is thinking? Read this book!" With a foreword from Steve Blank, Talking to Humans is a practical guide to the qualitative side of customer development, an indispensable skill for vetting and improving any new startup or innovation. This book will teach you how to structure and run effective customer interviews, find candidates, and turn learnings into action. Given that we all communicate with people every day, you would think that talking to potential customers would be an easy task. Unfortunately it's not. After watching countless entrepreneurs and intrapreneurs struggle with customer development concepts, we decided to put together this short, practical guide. If you are interested in learning how to run effective experiments, check out the sequel Testing with Humans. You can purchase the book on Amazon, however if you are with a non-profit or educational organization, we share the book for free. But wait, where can I get the cartoons? Who is behind the book? Giff Constable (giffconstable.com) is a repeat entrepreneur who has sold three companies and helped build many others. In 2014, he wrote the award-winning book Talking to Humans, in partnership with Frank Rimalovski, which is now standard reading in university and accelerator programs around the world. In 2018, they followed up with the sequel Testing with Humans. He led the globally recognized innovation consulting firm Neo as CEO until its acquisition by Pivotal, and personally led major projects at the Mayo Clinic and Time Inc., among others. He has held product and business roles across multiple startups, and provided M&A and IPO services to technology firms while at Broadview/Jefferies. He tries to give back to the entrepreneurial community whenever possible. He lives outside of New York City with his wife and two children. Frank Rimalovski is an early-stage investor and entrepreneurship educator with over 25 years of experience in technology commercialization, startups and venture capital investing. He is the founding executive director of New York University’s Entrepreneurial Institute, and managing director of their Innovation Venture Fund. In 2014, he collaborated with Giff Constable to produce the award-winning book Talking to Humans. Frank currently serves as a mentor at TechStars, and teaches entrepreneurship at NYU’s Courant Institute. He has previously taught at the Tandon School of Engineering, and as an Instructor in the NSF’s I-Corps program, and has trained and mentored hundreds of entrepreneurs in customer development and lean startup methodologies. Previously, he was a founding partner of New Venture Partners, director/entrepreneur-in-residence at Lucent’s New Ventures Group, and has held various positions in product management, marketing and business development at Sun Microsystems, Apple and NeXT. He lives outside of New York City with his wife and his increasingly mellow mutt. 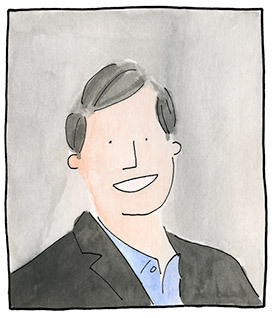 Tom Fishburne (marketoonist.com) started drawing cartoons on the backs of Harvard Business School cases. 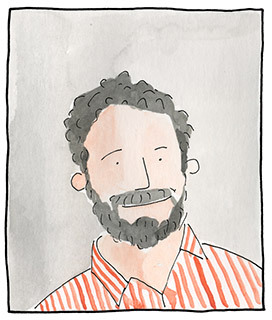 His cartoons have grown by word of mouth to reach 100,000 business readers a week and have been featured by the Wall Street Journal, Fast Company, and the New York Times. 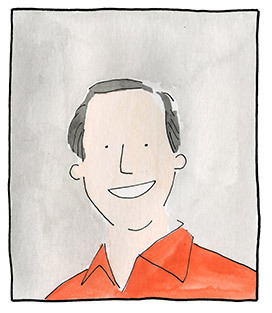 Tom is the Founder and CEO of Marketoon Studios, a content marketing studio that helps businesses such as Google, Kronos, and Rocketfuel reach their audiences with cartoons. Tom draws from 19 years in the marketing and innovation trenches at Method Products, Nestle, and General Mills. He lives near San Francisco with his wife and two daughters.